A list of articles, a radio broadcast and newspaper stories based on our work with Maine butterflies is shown below. To view any item, please click the link or copy the link into your browser. Article by Deirdre Fleming dealing with our adventures in the field as volunteers for the Maine Butterfly Survey. Posted July 13, 2014 in the Outdoors section of the Portland Press Herald – Maine Sunday Telegram. An interview with Rebecca Reineke dealing with our work as volunteers with the Maine Butterfly Survey. Published in Maine Insights – a statewide news magazine in 2014. An interview with Dave Sherwood dealing with our work surveying butterflies on Swan Island (Steve Powell Wildlife Manangement Area), Perkins TWP, that was broadcasted on PRI. Gobeil, R. E. and R. M. F. Gobeil. 2014. A Survey of butterflies found at a reclaimed municipal landfill Superfund site in Saco, Maine (York county). News of the Lepid. Soc. 56 (4):160-165. Gobeil, R. E. and R. M. F. Gobeil. 2014. A Survey of butterflies found on Swan Island (Steve Powell Wildlife Management Area), Perkins Township, Sagadahoc County, Maine. Limenitis VII:7-14. Checklist Butterflies of Swan Island, Perkins TWP, Maine (Steve Powell Wildlife Management Area) (2014). Checklist created by Robert E. Gobeil and Rose Marie F. Gobeil in cooperation with the Maine Department of Inland Fisheries and Wildlife (MDIFW). Gobeil, R. E. and R. M. F. Gobeil. 2014. The importance of power transmission line right-of-ways as habitat for butterflies in Maine. News of the Lepid. Soc. 56 (1):24-27, 12. Gobeil, R. E. and R. M. F. Gobeil. 2014. Low Numbers of Monarchs (Danaus plexippus) Recorded in the U.S. and Canada during the 2013 Fall Migration. The Maine Entomologist. Vol. 18 (1): 2-3. Gobeil, R. E and R. M. F. Gobeil. 2013. Notes on the Habitat and Behavior of the Dusted Skipper, Atrytonopsis hianna, in York County, Maine. The Maine Entomologist. Vol. 17 (2): 2-3. Gobeil, R. E. 2012. Butterflies Recorded at the River Point Conservation Area BioBlitz in Falmouth, Maine on June 29-30, 2012. The Maine Entomologist. Vol. 16 (3): 3. Gobeil, R. E. and R. M. F. Gobeil. 2012. Status of the Common Buckeye in Maine. Limenitis V: 6-8. Gobeil, R. E. 1962. 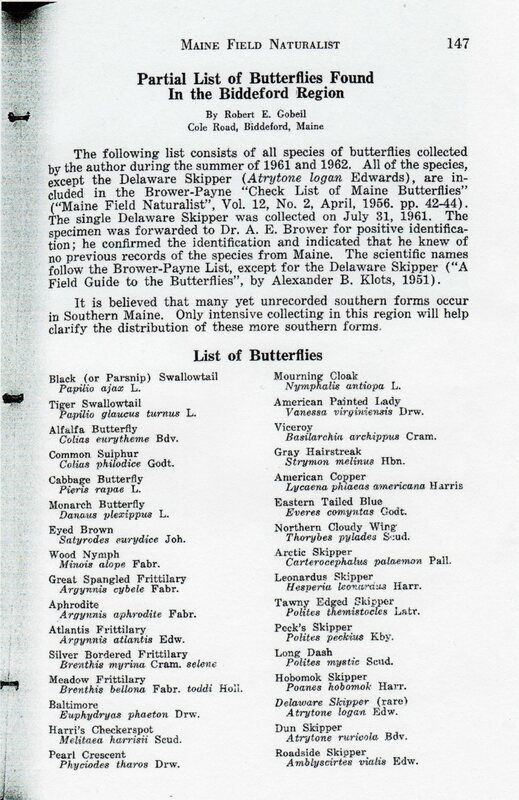 Partial List of Butterflies Found in the Biddeford Region. Maine Field Naturalist 18 (10): 147.